Current BSc Accounting Students mingling with Leaving Certificate Students. 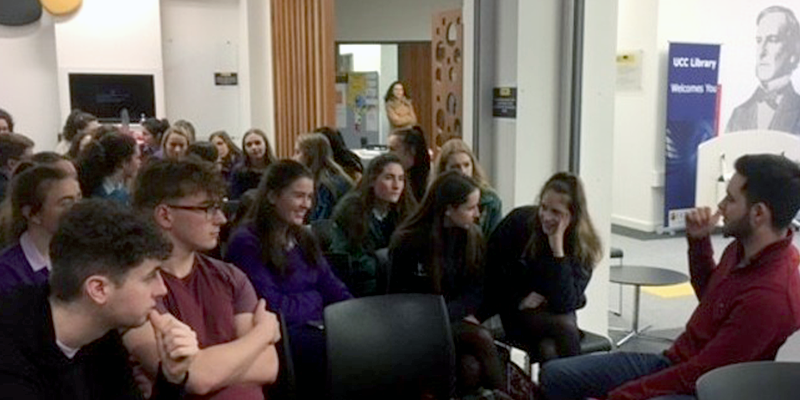 Our Department of Accounting & Finance recently held their successful Accounting Seminar for Leaving Certificate Students considering studying the BSc Accounting programme in the Creative Zone in the Boole Library at UCC. Over 80 students from various Munster schools attended the event. Dr Michelle Carr, Discipline Head of Accounting and Dr Sandra Brosnan, the Programme Director, kicked off the event with an introduction and overview of the various options available to students who study CK202 – BSc Accounting Degree – and its benefits. Following this, five very interesting presentations were deliver by graduates of the BSc Accounting Programme, all currently working in either practice or industry. These alumni explained the vast career options available to them as a result of studying Accounting. Ms. Aileen Waterman, the programme Placement Coordinator gave a fantastic presentation on the 6-month paid placement the students undertake in their 3rd year and the various employers that offer excellent experience to our students. Aileen explained to the group that as a result of the placement process, the vast majority of Accounting students are offered full time positions on completion of their degree. Both current students and former students, along with members of the Accounting and Finance Society then broke the students into smaller groups which provided the opportunity for prospective students to get a sense of the various aspects of college Life! All in all, a very successful and informative morning was had by all.